Jal Mahal or Water Palace, is situated on the middle of the Man Sagar Lake in the Jaipur City. The Palace and lake around the Jal Mahal were renovated in the 18th century by Maharaja Jai Singh II. The Jal Mahal Palace according to its name is a fabulous palace which is floating on water. It is located at a distance of 6.5 kms away from Pink City. The atmosphere of this palace always remains cool as it is situated inside the lake as well as also accompanied by the hills around the lake. In earlier days it was a spot for the members of Royal families to shoot ducks from this palace. This is a five storey palace, out of which the first four floors are submerged under water, only the top floor of this palace enjoys the sunshine and rain. Even after the 200 years of construction, still its architectural beauty is the same as it was before. The red stones of the palace look very beautiful during the monsoon season. One can find the shrines of the Royal families on the back side of this palace. Visitors are only allowed to see the Palace from a distance. Entry is not allowed in the palace. It is one of the best examples of Rajput architectural beauty and the technical excellence. Rajput styled wooden boats have been created by the traditional boat makers of Vrindavan. There are some beautiful gardens and Rajputs architectural styled walls situated to the south of the Man Sagar Lake, which are waiting for enthusiastic travelers. The Chameli Garden is the most attractive place in the Jal Mahal. Chameli Bagh is on the terrace of Jal Mahal which acts as the crowning beauty of the Palace. Views of the entire valley can be seen from here. The beauty of the white marbles and the walkways invites the tourists to sit in the garden among the fragrance of flowers. Chameli Bagh shows the remains of the Mughal and Rajput gardens. It is built in traditional Char Bagh style and each of its side has a beautifully raised flower bed made of marble. These beds are planted with fragrant flowering plant. There is a temporal exhibition inside the Jal Mahal Palace which features the art and craft of Rajasthan. The exhibition is divided into four themes i.e. water, monsoons, gardens and celebrations. Each part contains miniature paintings and crafts. It also depicts the magnificent costumes and jewellery of the Maharajas who ruled over Rajasthan. Celebration and games of that time are also displayed through a full sensory spectrum. Paintings from the time of Rajputs and Mughals are also displayed in the painting exhibition in the Jal Mahal Palace. There is some story which is hidden behind each painting. The Rajput paintings show the influence of Mughal style. The paintings show a number of themes and events from epics like the Mahabharta, the Ramayana and also from Krishna’s life. Beautiful landscapes and humans are also displayed in these paintings. Rajput paintings show a dream world of fantasy and color and also show the Indian romantic past. These paintings explore the background of historical art and the Mughal influence. These also depict the haunting activities of Rajas and Maharajas of that time. The structure of the bodies of males and females in the paintings has been influenced by Rajasthani folk art. The beautifully decorated doors and windows are a fine example of Maharaja Sawai Madho Singh style. It is open for public viewing from 10:30 am to 5:30 pm. 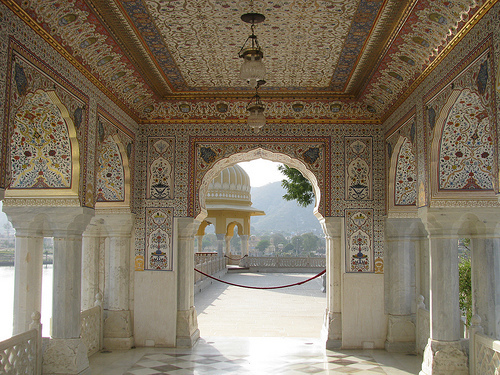 The best time to plan a trip to Jal Mahal is in the month of October or March. This is the best time when tourists gather here in large number to experience the royal ambience of the palace.